Johnny Marzetti is a lasagna casserole recipe that is comfort food at its finest. This popular Italian American dinner is a great way to feed a crowd on a budget, without sacrificing flavor! 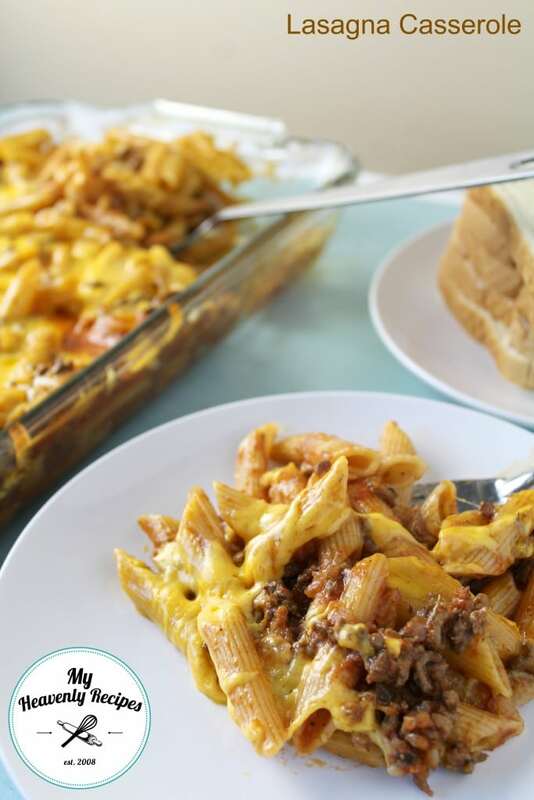 If you’ve tried my Homemade Spaghetti Sauce or Homemade Lasagna with Fresh Ingredients recipes then you’ll want to make this Johnny Marzetti Lasagna Casserole. Johnny Marzetti is an Italian American pasta casserole, popular in the Midwestern United States. It’s pretty much the same as a traditional lasagna recipe, however, it voids the ricotta cheese, and it uses a smaller pasta, so there is no layering of the lasagna noodles required. 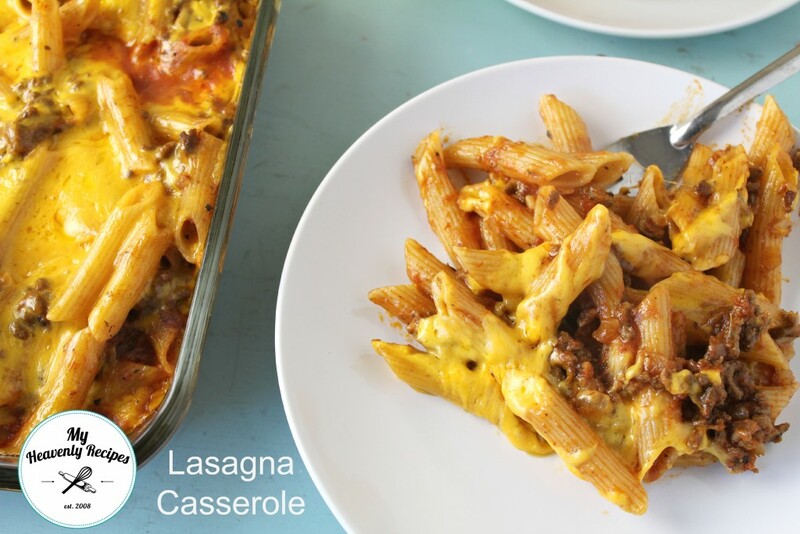 I love casserole meals and realized that I haven’t even shared one with you until now. 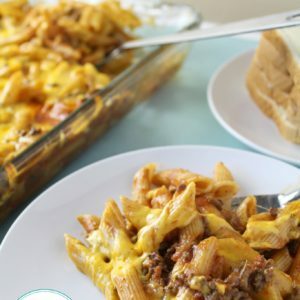 So if you love casserole recipes as well, be sure to stay up to do with all of My Heavenly Recipes social media and be sure to join my Weekly Newsletter to get the latest recipes from my kitchen into yours. I may have mentioned this before, but when I was growing up, we ate a lot of budget friendly pasta dinners. Hamburger Helper (which I now REFUSE to eat), Tuna Casserole (which I still haven’t made as an adult! ), Skyline chili, and Spaghetti O’s. We were a family of 6, always on the go and my parents hustled to get us to and from practices every day of the week. As the oldest and the only girl, I would oftentimes get out eaten by my brothers. In fact, I would often hide food in my room, just in case I would get hungry! I vowed to myself to never make my kids eat the same things like that over and over again. I think that is why I created My Heavenly Recipes – to help you get out of that food rut we often get in. I was finding myself making the same things over and over again. Then realized ya’ll needed some of my best recipes and decided I needed out of that rut! Johnny Marzetti is a great meal to double up the recipe and take to a friend in need. Deliver it to a Mom who just had a baby, drop some off to a elderly family member or just to freeze and heat on those nights that you are crazy busy and in need of a quick meal. I often serve Johnny Marzetti alongside a salad and homemade garlic bread. My kids and husband leave nothing left on their plate and many times get a second serving. I say that Johnny Marzetti lasagna casserole is a Heavenly Recipe that’s kid tested & Husband approved! Johnny Marzetti is a lasagna casserole recipe that is comfort food at its finest. 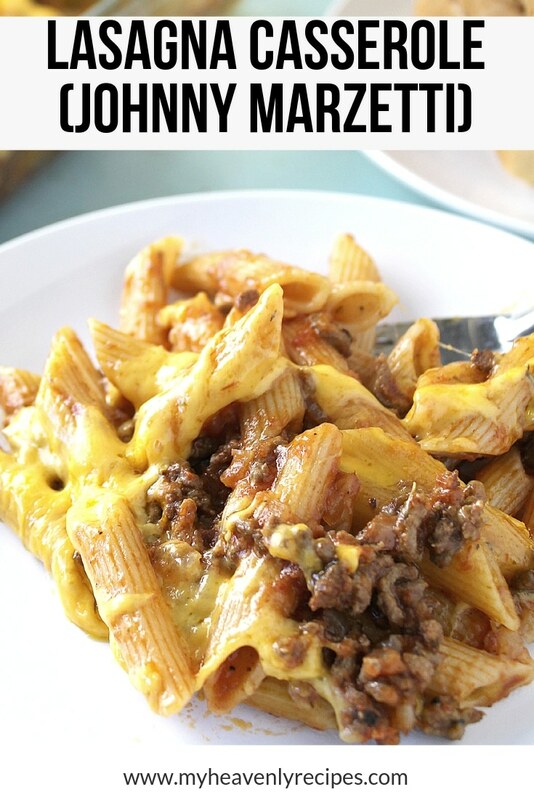 This popular pasta dinner is a great way to feed a crowd on a budget, It also makes a great freezer meal. In a large pot boil water and cook noodles according to box, drain. I use penne noodles. In a large skillet brown onion & hamburger until hamburger is cooked through. Place meat mixture back into the skillet adding in Italian Seasoning, sugar, pepper, tomato sauce and water. Mix together. In the bottom of a 9x13 baking dish place 4 tablespoons of meat mixture and spread. This will ensure the noodles don't stick to the bottom of the pan as if you were cooking Lasagna. Spoon noodles over the top of the sauce and add another layer of sauce, alternating until no more noodles and sauce mixture remain. Toss together to coat all the noodles. Top with your favorite cheese. Cover with aluminum foil and bake for 20-30 minutes until the casserole is heated all the way through and the cheese is melted. If you want to brown the cheese a bit remove the foil and let cook for another 10-15 minutes. What a delicious, easy, family friendly recipe! This looks like the perfect way to enjoy the fabulousness of lasagna anytime – so much less work and all the great flavors. Can’t wait to try this – thanks for sharing! I agree, I hated eating the same thing over and over again! I use a 3-month no-repeat meal plan so I can make sure I don’t do that! Where does the name Johnny Marzetti come from? This looks really good, pinned! Found you on Merry Monday blog party! It’s pretty delicious! I hope you’ll give it a try and let me know how much your family enjoyed it 🙂 Have a great week and Happy Thanksgiving! Hey Trisha, the 3 month no repeat meal plan sounds wonderful! So Johnny Marzetti came from up the road in Columbus, OH. Back in the late 1800’s there was a restaurant that was owned by Theresa Marzetti. She actually made this dish for her brother and so Johnny Marzetti was born! You had me at ‘Marzetti.’ One of my favorite dishes of all time! Making this tonight and you didn’t add what temperature to cook this dish at. Going to go with 350. Yes 350 is perfect. My apologies for the late response. We are trying to get on a Summer Break schedule with school now being out. Let me know how it turned out Jessica! OMGosh!! My mom makes this (is from Ohio) and calls it the same thing (with a little variation) No one ever knows what I am talking about!! Nice to know the back story. Do you have a favorite cheese to top this casserole? I’m making this tonight and was curious if you had a favorite! Hi Kristi. I usually do Mild or Colby because that’s what I have on hand. But, you could totally use a Pepper Jack to give it a little kick. Let me know what you think. Cheers!